Thank you for considering The Party House in Seneca Falls for your upcoming event. Our experienced staff will provide you with a memorable experience. We require a non-refundable deposit of $250.00 for events on Sunday through Friday and a $500.00 deposit for Saturdays. Final payment will be due the day of your function unless otherwise agreed upon. These deposits may be cash, credit card, or money order. If your event is cancelled, your deposit will become property of The Party House. Menu prices are subject to change. Prices are guaranteed 30 days prior to your event. We prepare approximately 20% extra food. You may purchase all the extra food to take home for 20% of your total food bill. Your guests can eat as much as they want at the Party House. We do not allow to go containers. All food and beverages must be purchased from the Party House. No outside food or beverage will be allowed with the exception of cakes, cookies, and desserts. We offer a complete selection of beverages to compliment your function. All alcohol sales are regulated by New York State. The Party House, as a licensee, is responsible for administration of these regulations. It is our policy that no liquor, wine, beer or any beverages may be brought into the facility from outside sources. Proper identification is required for all. 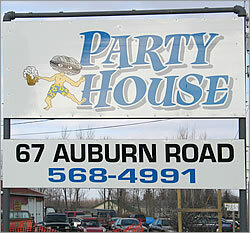 The Party House will supply music for $20.00 per hour (inside and outside of the building). There are speakers outside on the deck. There are speakers outside on the deck and in both pavillions. You will be responsible to pay for your final head count, given 1 week prior to your event, unless you go over. If you go over, you must pay the rate per person for all extra guests. There is a gratuity charge which covers the setup and clean up etc. based on the event. New York State sales tax states that 8% be charged on all food and beverage.